I hope you all had a fantastic Christmas! We kept it real with the following traditions. We wore festive outfits and drank mimosas. 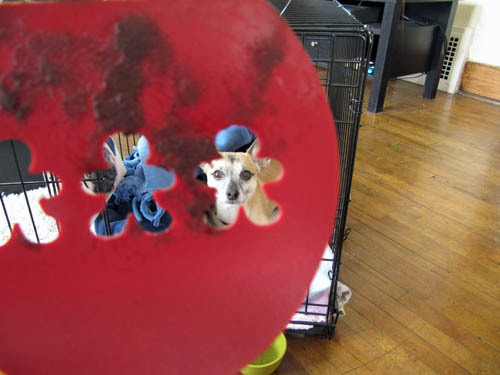 I took a picture of Elliot through my chocolate-covered gingerbread men spatula. He thought that was pretty fun. We sipped mimosas all day while sitting on the couch, listening to Elvis Christmas songs and watching A Christmas Story and Home Alone 2. This year we got a real tree! I thought it was a Douglas Fur, but Jake says it’s an Albus Fur, which I don’t mind. It reminds me of Dumbledore. 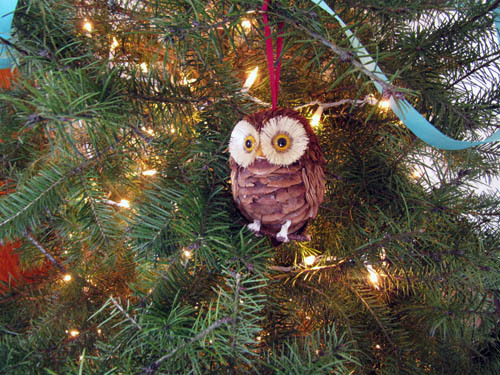 We just decorated the tree with lights and this owl ornament. Cheese and cracker snacking takes us through lunch since Jake make’s a big dinner every year. 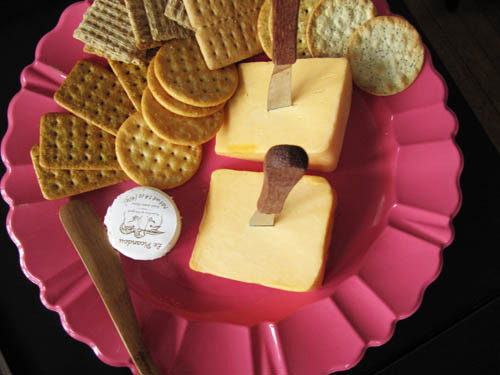 This year we got fancy goat cheese, an applewood smoked cheddar and an English cheese with a long name. 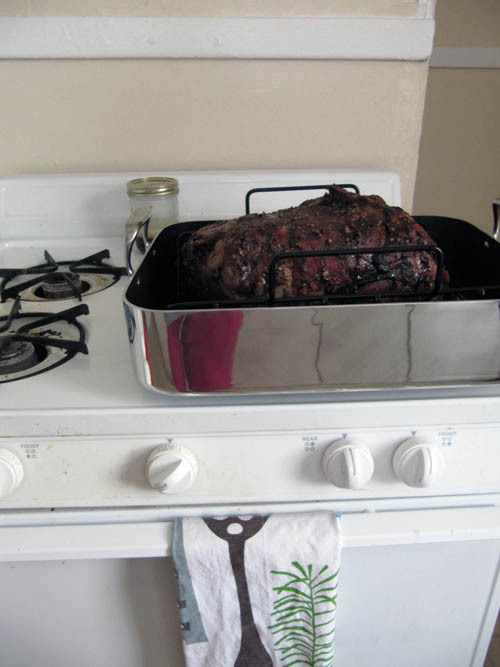 Jake made us a roasted pork shoulder with fancy holiday spices. And that’s our super pretty new roasting pan. It was a Christmas miracle! We also had roasted potatoes, but we gobbled them up. It was a good Christmas filled with tasty food, bubbly drinks, my tall drink of water of a boyfriend and my cute little pup. P. S. These are the Christmas cookie boxes I gave out, this year. 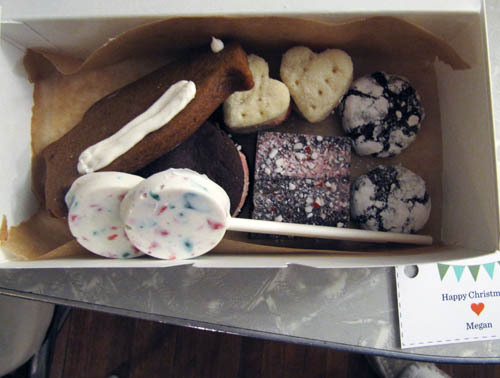 They included: Gingerbread Penguins, Peppermint Bark Lollipops, Candy Cane Oreos, Cream Wafers, Quick Toffee Squares, and Mini Chocolate Crinkles. Megan I love it! 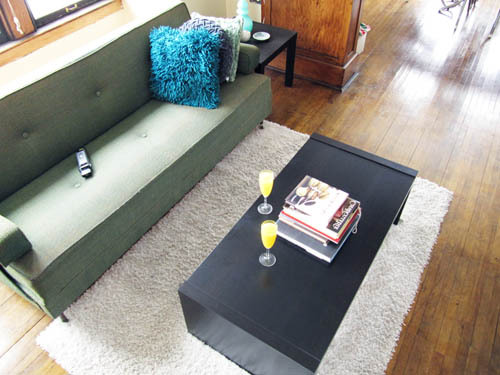 Looks like so much fun and your apartment pretty much looks amazing. Thanks Lora Bora. When you visit we’ll drink mimosas with breakfast. Don’t you worry. I loved seeing a glimpse of your Christmas.. 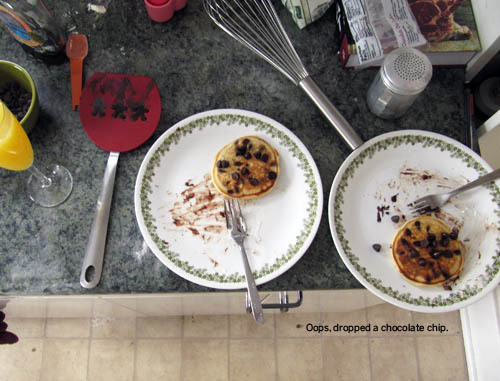 I think my favorite picture was of Elliot peeking thru the tiny opening in the pancake turner! So cute!! Elliot is a pretty cute pup. 🙂 Thanks for the hip gingerbread cut out pancake flipper! I love getting cooking utensils and accessories for christmas! This year I received a cast iron skillet (preseasoned!) and a 14″ pastry bag (with tips to make beautiful cupcakes!). Kara- Me too! Ooh those gifts sound so fun! I want one of your gift boxes! I love the mimosas – it’s not a celebration without them! And you totally should make Cream Wafers! They are tasty! We make a tradition of Christmas breakfast mimosas. I hope you had a lovely Christmas this year!